Red and green, merry and bright, ho ho ho. It's all Christmas, all the way through. … but how does it translate to a timeless, non-cheesy wedding? I wasn't a typical Christmas bride and went the route of a colonial Christmas theme with navy blue as the primary color inspiration, so I'm not much help here. 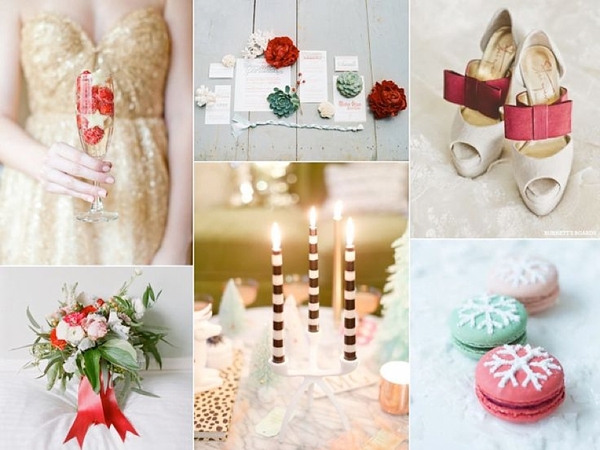 So I'm excited to have my gal and inspiration board queen, Sara of Burnett's Boards, sharing some classic, red and green, yet stylish Christmas wedding inspiration today! Hello, gorgeousness to put you right in the holiday spirit! If you're envisioning a Christmas wedding, you might be see the holiday in one of two ways – completely red and green with holly leaves and jingle bells or retro with multi-colored lights and tinsel. For this Christmas wedding inspiration board, I wanted to use the iconic red and green color palette while giving it a slightly new makeover in elegance and seasonal beauty when it comes to a wedding. Get to know Burnett's Boards and her totally swoonable style creations more on Instagram, Pinterest, and Facebook.